And I really must get my Etsy shop up and running…. 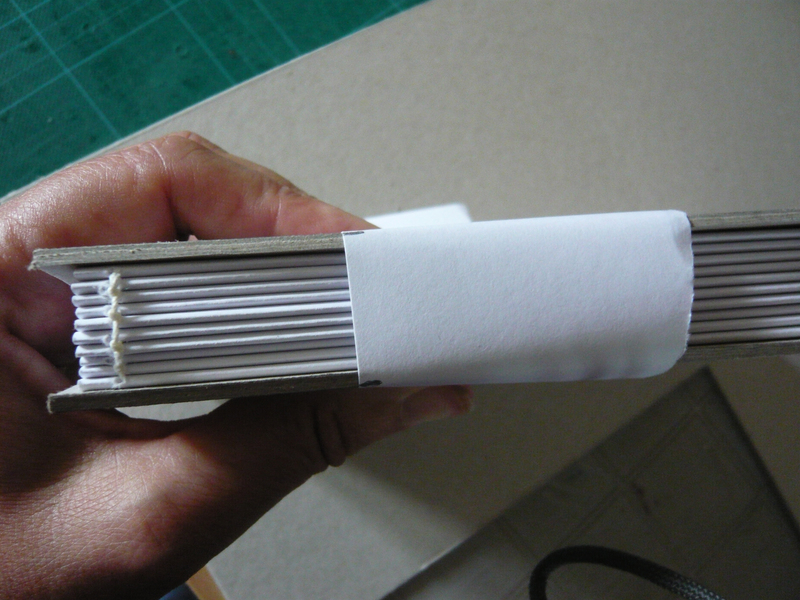 This method will make an A5 sized book. It looks like this. I use linen thread. Ordinary sewing cotton is not strong enough. This will protect your table/work surface! 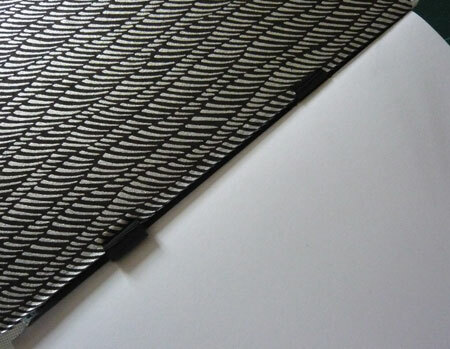 This is a tool used to flatten folded edges. You can use the back of a spoon if you don’t have one. 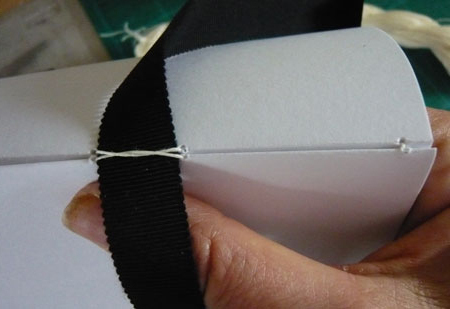 I like to use petersham ribbon (the ribbed kind, also called grosgrain) as it stays tied tightly – satin ribbons can slip. 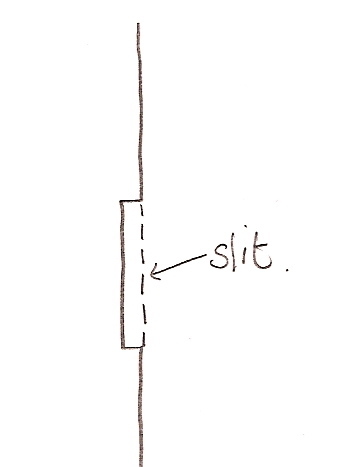 It should be approx 1.5cm wide. This should coordinate or contrast with the paper you are using for the outside of your book. Large sheets to protect work surface. • First fold all the paper sheets in half. Use the bone folder/spoon to make a very sharp crease. Place 4 sheets inside one another to make a section (also called a signature) – you will obviously end up with 10 sections. • Take one of the sections, and starting at the right side, place a mark on the crease 0.5cm from the end, then 5cm from the end. 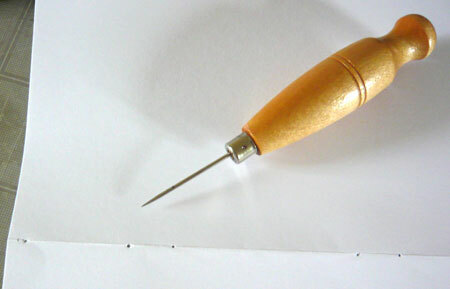 Then make a mark 0.5cm and 5 cm from the other end. Then make two more marks a ribbon’s width from the 5cm marks (so approx 6.5cm from each end). • Holding all ten sections together, repeat the markings on all sections. • Using an awl or a needle, open out each section and holding them carefully in place, pierce a hole at each marking, making sure the pages don’t slip. • Cut the piece of ribbon in half. • Measure a length of thread which is 10 and a half times the length of the spine. Tie a knot at one end and then thread the needle. • Let’s label the holes to make the next bit easier to explain. • Let’s call each hole by its letter and the number of the section it is on, so hole B on the second section will be B2 for example. • Take the first section, open it up slightly, holding each sheet tightly in place, push the needle in through hole A1 from the outside then come out again through hole B1. 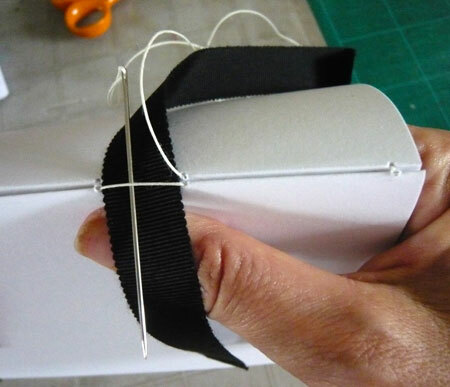 • Take one of the pieces of ribbon and hold it in place between holes B1 and C1. Pass the thread over the ribbon and go in through hole C1. Come out through hole D1. • Take second piece of ribbon, place between holes D1 and E1 and passing the thread over the ribbon, go into hole E1 and finally emerge again at hole F1. Make sure that the threads are pulled tight (but not so tight that they tear the holes). • Now close the first section, take the second section and place it next to the first one. Open up the second section and go into hole F2 on the second section. • Come out of hole E2. You are going to go over the ribbon into hole D2 but before you go into D2, pass the needle and thread UNDERNEATH the thread leading from E1 to D1. • Next out of C2 – under the thread from C1 to B1 and then into B2 and emerge again at A2. Attach the third section and carry on. NOTE: every time you pass over the ribbon pass under the thread from the previous section (not the first thread every time). This will tie the sections together securely, with the added bonus of creating a pretty herringbone pattern which nobody can see in the finished book but I like to know it’s there! • When you get to A3, tuck the needle under the stitch passing from A1 to A2 and pass the needle through the loop in the thread, forming a knot (called a kettle stitch) This will further strengthen the sections. From here, do this kettle stitch everytime you add a new section. • You have just made a text block. • You now need to cut three pieces of board. Two will be the covers of the book. Each one is 1cm longer than the text block length and 0.5cm longer than the text block width. ie. you want the covers to be 0.5cm bigger than the text block ON 3 SIDES. • When you have marked out the cover on the board, cut it out using the craft knife and the metal ruler to ensure the edges are straight. • To measure the board for the spine of the book, hold the text block between the two cover boards and using a scrap of paper, measure the width of the text block and the two covers. This gives you the width of the spine piece. The length of the spine piece is the same as the length of the two book cover pieces. 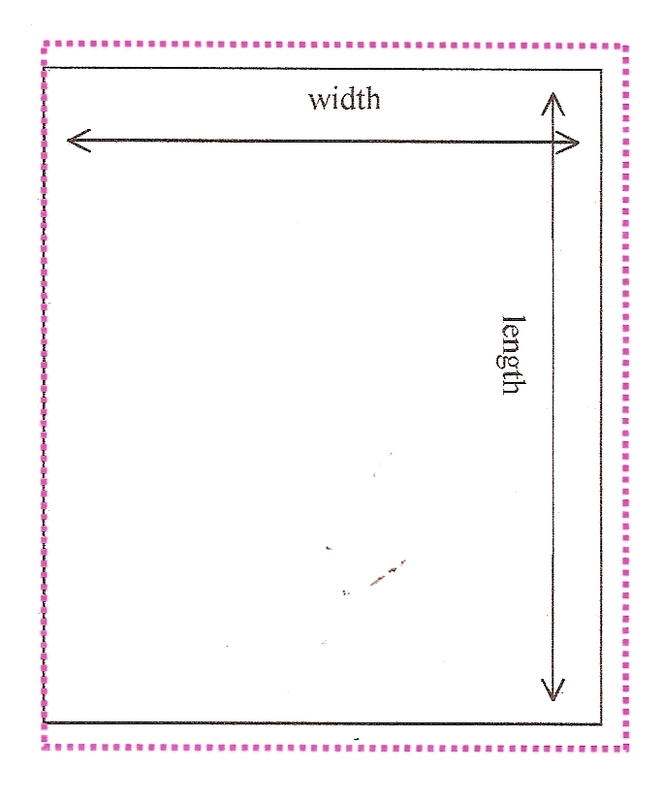 • Use this piece of paper to mark the width and then cut out the third piece of board. • Place the text block on to one of the covers as in the diagram below so that the block is lined up with one of the long sides and is centrally placed along it’s length. Mark the position of the ribbons with a pencil. 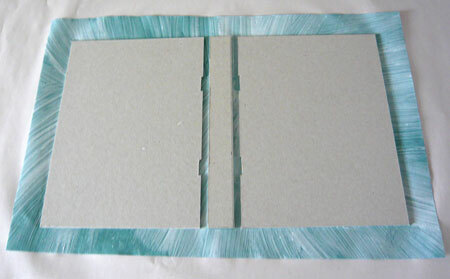 • Carefully, cut two very slim notches in each cover as shown here. 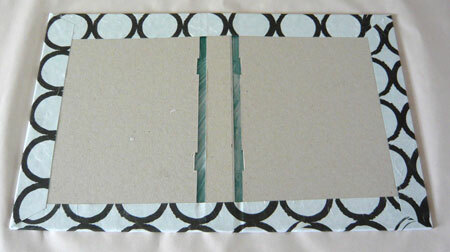 • Place several sheets of scrap paper onto your work surface, one on to top of the other. 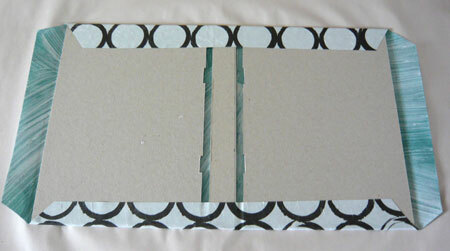 • Lay the decorative cover paper face down on the scrap paper. Arrange the boards as shown leaving a 0.5cm gap between the spine board and each cover. 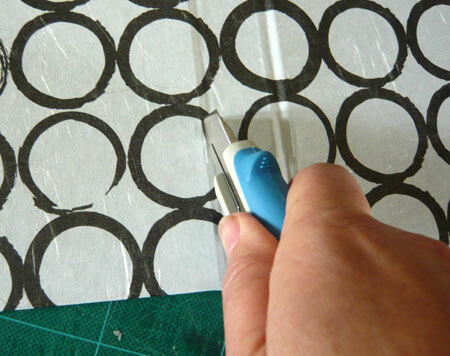 Cut the decorative paper approximately 3cm bigger all round. • Remove the boards and get ready to glue! This is the messiest bit of the whole process. I buy big pots of PVA glue as I get through rather a lot of it so I next decant some into a smaller pot. 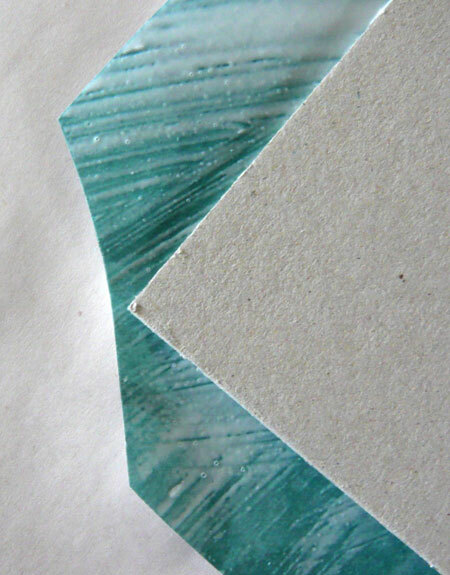 Hold the cover paper in place in the centre and start applying glue from the centre outwards onto the scrap paper. DO NOT LET THE PAPER MOVE as you then run the risk of getting glue on the front of the paper. 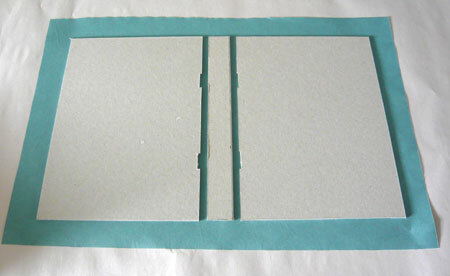 • Replace the cover boards in position on the glued paper. 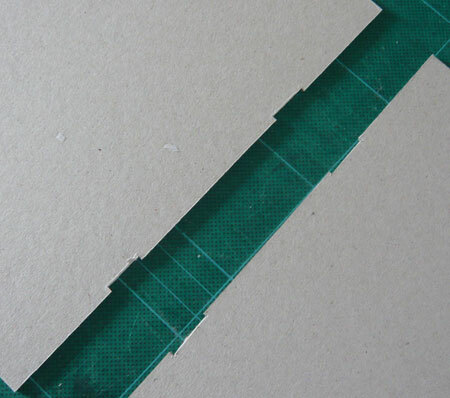 • Cut a triangle from each corner staying about 0.5cm away from the corner of the board as shown. 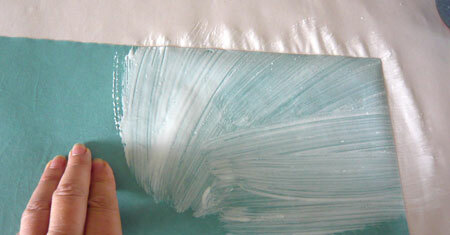 • Fold the cover paper along the top edge, smoothing it down to ensure the glue holds. • Turn in the sides, making a neat ‘hospital corner’ at the corners. • Turn the cover over and smooth out any air bubbles carefully on the front. Leave to dry. • Now we need to cut the paper for the lining of the cover. Measure a piece of your contrasting paper which is about 1cm smaller than the book cover on all sides. • Now, using the same glueing procedure as before, glue the paper and carefully place it onto the cover, trying to place it evenly and smoothing out any air bubbles. 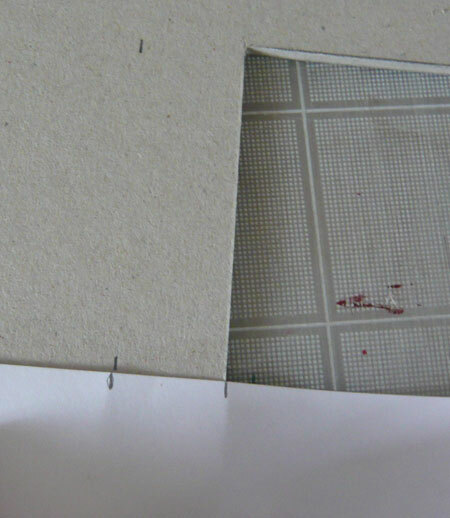 • Once the cover is dry, turn it over and very carefully, locate the slits you made earlier and then slit the lining paper THROUGH the existing ribbon slits so that they are the same size and in the same position. • Once this is done, if the cover looks a little warped – not flat then place some heavy books on it and leave for a few hours or gently flex it to straighten it. 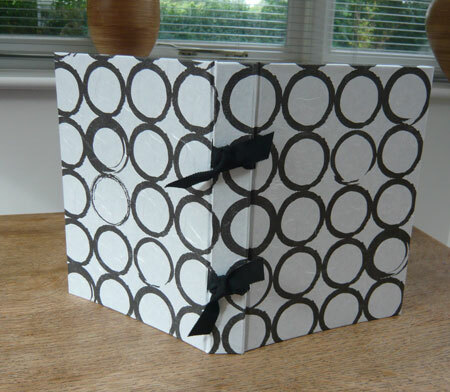 • Place the text block inside the cover and then feed the ribbons through the slits on to the outside. • Tie the ribbons in a neat double knot and trim the ends diagonally. You can seal them with clear nail varnish to prevent fraying. Once you are confident with the method for making these books you can adapt this process to suit yourself. More or less pages, use the paper to suit your needs – sketch paper, cartridge paper, watercolour paper. 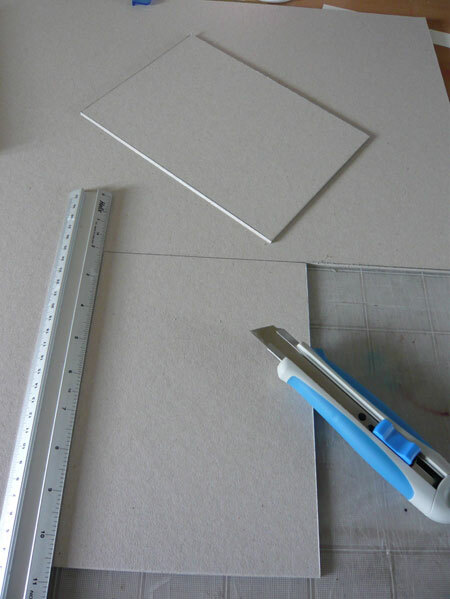 Make it whatever size you want by cutting large sheets of paper down to size. The measurements are all comparative so you can usually adapt sizes by eye. If you use heavier weight paper, you might want less pages and fewer pages per section. Just do whatever, looks and feels right. Fantastic, must try this myself. Thanks so much! I’d rather pay for them…. Good clear instructions Diane, this will be a useful tutorial to return to, or to send people to for advice. Diane, it’s looking very professional and probably that’s the best part about it. I strictly believe when you are imparting your knowledge, it should be done with fair amount of professionalism; you have fully lived up to it. This was far more than I expected, in a good way! How wonderful that you not only shared the knowledge, but showed it step by step! Thank you so much for a wonderful tutorial! Thank you, very helpful tips. Wonderful instructions! Maybe we can use your help on one of our publications someday. I feel the same as laketree, I’d rather pay you to do it. Although it does look like fun, if I had the time. do you sell these on amazon?? Kim – hurrah for you! My first ‘proper’ customer! carol – praise from a ‘real’ bookbinder is praise indeed! Thanks! scratchbags – you are very kind – I wanted to be a thorough as I could be! JerseyGirl – you spurred me on to finally do this so thanks to you! suburose – you rock too! I love your latest giveaway – right up my street! 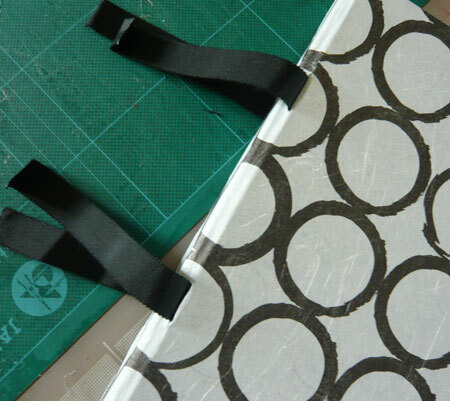 This is ‘THE BEST’ bookbinding tutorial I have come across… Where have you been??? Thank you so Very Much!!! This is a great post. One of these days, maybe I’ll try it, but in the meantime, I’ll just buy them! But your instructions look great and easy to follow. The pictures definitely help. Clare – I’ve been here! Thank you for the nice comment! Wow! How beautiful. What a terrific resource. I have a huge following for my free monthly Plot Tips eZine. I’ll announce it in tomorrow’s edition. Hope you receive lots of hits!! Awesome work Diane! Such detail. I would try it out however, since breaking my wrist, I don’t have full strength back and not sure that I could do the sewing just yet. Maybe I will pass it onto my niece who loves crafty stuff and let you know a bout the instructions. Cool notebook. Amazing ! :D I think my daughter would be very interested. ange – poor you! Hope you are in too much discomfort. I hadn’t thought to notch the book board for the ribbon, I construct mine like a normal case bound book so they have book cloth spines, but I might try a board spine! Geez ! That’s something ! It’s great and rather impressive to see the different stages of your work. Thank you for sharing Diane. Wow, great tutorial! I tried it last night and loved the result I got. It was also pretty easy and fun. The only thing I really messed up is doing the slits when the glue was still wet. Would you be okay if I sold a variation of these on my shop on etsy? The only way I know how to bind is japanese stab–i’m so glad to learn more ways and thanks so much for this!!! your books are so lovely! Hi Dianne! Thank you so much for this amazing post! I’ve always had trouble making a perfect book. Yours look perfect! I will try it soon; would it work if I use cloth instead of paper for the cover? 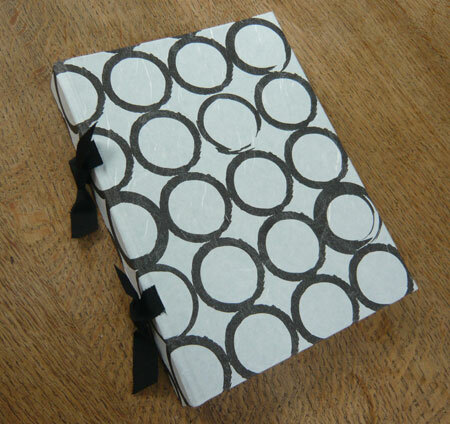 Do you plan to put up tutorials for your other ways of book binding? Hi Dianne. I loved the tutorial and I decided to try to make one of these books. I hope I can finish it by tomorrow night (I’ve already stitched everything and cut the boards). The only thing I missed was the thread leading from A1 to A2. I thought I had followed the instructions correctly but then I couldn’t find this thread in order to secure the 3rd signature. Anyway I managed, in the end, to make some weird loops and now everything is nice and properly secured. Thanks a lot. I’ll try to take a picture to show you. I found you from Teresa’s blog. I’m new to the UK (Wales) having drifted over here from Indiana this winter. Where do you get your book binding supplies? I used to do this kind of craft in America and I loved it so much and I miss it. I left almost all of my supplies at home thinking I’d be able to find them here and I have had such a hard time finding things. Thanks for your help. You do have a lovely site. I’m excited to explore it a bit. I get most of my supplies from Falkiners (now known as Shepherds) on Southampton Row in London. They have a good website and are brilliantly helpful and efficient. Great supply of Japanese Chiyogami paper. Lovely place to visit! Also Hewits. Their website isn’t quite so good but if you already know what you want then you can usually find it there. They are particularly good for leather. Just found a new place called Ratchfords which is great for bookcloth. Their website is OK but you don’t order online, you have to email them and ask for what you want and then they call you back. Very efficient and speedy though. Also Paperchase on Tottenham Court Road in London has a huge array of papers from all over the world – very tempting! You can find other links on my ‘Links’ page. I have mostly stopped sending for things from the US (Paper Source, Paper Mojo and John Neal) as it is just too expensive. I like the way I can remove the text block and change signatures to fit my needs. I am going to use this method for my book journals. I thought that too but to be honest, I just keep making new books! This is amazing. I love your books!!! How long do they take to make? I have been looking for a tutorial for so long. How did I miss this? This is absolutely wonderful. These are superior and professional! I loved the books on your slideshow, outstanding! Thank you so much! Each one takes a day to make (allowing for glue drying time) Glad you like them – it’s all down to the beautiful paper I track down! I have never seen this type of book binding before, and I am so impressed and ready to try it out! I am all the way in Nigeria, if I was closer, I’d definitely buy your copies! Amazing Diane. I’m inspired…I shall save your instructions and your list of suppliers…that is should I ever find time for a new interest! Thank you for sharing such a beautiful craft. Very well and useful tutorial. Thank you very much. Thanks SO much for these incredibly detailed instructions and the fantastic photos. I’m going to try this today! Thank you SO MUCH for sharing these incredible instructions. I have been wanting to try this stitch and now, thanks to you, I can. Pingback: Book of Memories « How to be happy with less? This is beautiful!!!!! Thank you so much for sharing, I can’t wait to try it tomorrow! Is it possible to do with fabric on the covers instead of paper? What kind of adjustments would that need and would it be difficult? Thank you everyone, I’m glad you found it useful and you have great success in your efforts! You can use fabric instead of paper. You can either buy special bookcloth – which tends to have a backing to soak up the glue, or you can use ordinary fabric but it must be prepared properly otherwise the glue soaks through to the front of the fabric and looks horrible. I tried using some iron-on lining tissue, used in dressmaking – I think it’s called Wonderweb, ironed onto the reverse of the fabric and that works fairly well. Your books look fab but I’m afraid I am not creative in any way at all. I don’t suppose you offer the ribbon binding as a service? 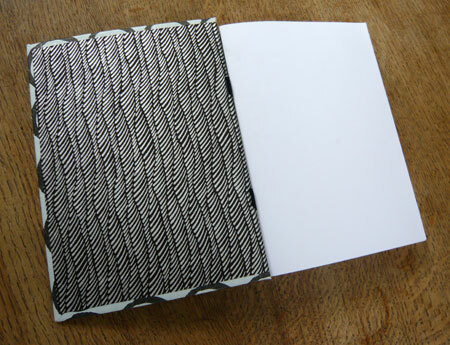 I am looking for 3 small books to be ribbon bound. The paper is likely to be A4 but perhaps only 20 pages of it. It is a collection of emails from my late Mum to me which I would like to give to my family as a keepsake. Your books would make it look far prettier than my attempts would! Is this something which you would be interested in? Fingers are crossed! It’s a beatiful work, I like it ! This is so cool. I love it. 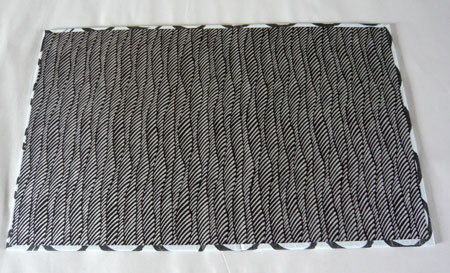 Is this a kettle stitch binding? I absolutely LOVE this project! So I read it, was a little overwhelmed by the stitching and then tried it! Gorgeous results! I shall be posting a picture at my blog soon! Thanks so much for sharing this! Your books are gorgeous!! I love them. Have you got your Etsy shop up and running yet? All of my books are currently case bound and I handpaint the calico covers or stitch them with felt. It is time consuming and a lot of energy goes in, but I love them. Hehe. More often than not, my house often resembles a book binding factory. Do you have a studio area? Any tips on where to source good quality cartridge paper? Apologies for all the questions. I am just so excited to have finally found your work and your blog! Thank you for posting this. I have been looking for a demo and beautiful book like this. I love it. Do you think it is possible to make this book without folding the pages. I want to make a standard 8 by 11 kraft paper. I plan on making a a love story wedding book. Thanks again. I am so glad I finally found this. Glad you found it useful! The paper is folded in half so that you have something to sew through. For this binding you do need a fold. If you can’t find paper which is twice 8 x 11 in size then you might have to try a different style of binding such as Japanese Stab binding maybe. 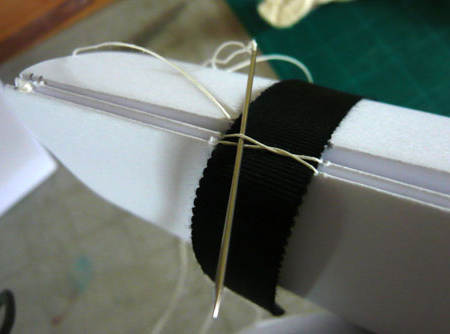 You can do this kind of binding using thin ribbon which is pretty. I have made photo albums by folding over just half an inch and sewing through that (when I needed a particular size and couldn’t get paper twice the size I wanted) but the folded section does show when you open the book and it does mean that the spine side of the book is twice as thick as the opposite, opening side of the pages. This doesn’t matter when you are going to stick actual photographs into an album as the photographs even out the thickness differential. If you see what I mean. Sorry if this sounds complicated but I it’s hard to explain! Good luck with your wedding book! Thank you! Hope you enjoyed making your book. Excellent tutorial! Your work is impeccable! Pingback: Love Letters | Simple. I Just Do. Hi Diane, Beautiful work. Many thanks. 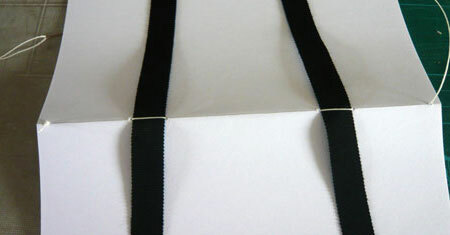 One question regarding the stitching to the ribbons, the crossing under is so elegant looking, does it have a name? I’ve only seen this once before. I’ve used this myself, together with just parallel/unlinked on the ribbons/cords and kettle stitches at the ends. Hi! I’d love to see the books you’ve made, but I can’t find the photos. How do I get there? Thanks! I have put a link to my Flickr photo stream instead so you can see them there. Thank you soo much for this tutorial! I WAS struggling to do this stitch in my bookmaking class, but this tutorial it has helped me make it through my class so much better! !